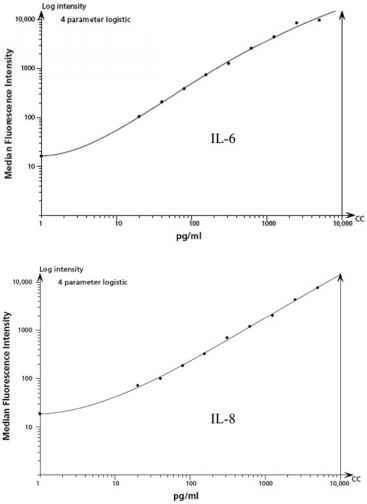 The standard curve for each cytokine covers a defined set of concentrations from 20 to 5000 pg/mL. It may be necessary to dilute test samples to ensure that their mean fluorescence values fall within the limits or range of the generated cytokine standard curve. For best results, samples that are known or assumed to contain high levels of a given cytokine should be diluted as described next. 1. Dilute test sample by the desired dilution factor (i.e., 1:2, 1:10, or 1:100) using the appropriate volume of assay diluent. 2. Mix sample dilutions thoroughly before transferring samples to the appropriate assay tubes containing mixed capture beads and PE detection reagent.